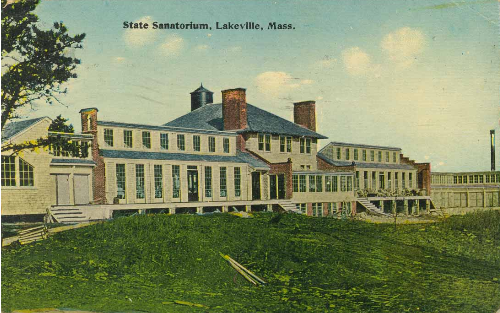 When the Lakeville State Sanatorium opened in January, 1910, it was considered a model of tubercular hospital design. Identical ward buildings flanking a central administration building were constructed for male and female patients. The design of these ward buildings by architect John A. Fox and the layout of the Lakeville complex reflected current thinking on modern sanatorium design at the time. Concurrent with the construction of the Lakeville hospital was the publication by the National Association for the Study and Prevention of Tuberculosis of a guide to sanatoria design. Entitled Tuberculosis Hospital and Sanatorium Construction, the volume discussed the importance of proper design, and it featured a photograph and floor plan of the Lakeville men's ward to illustrate the tenets it outlined. An essential point to be considered in planning buildings for advanced cases, is that tuberculous patients in the last stages of the disease are very annoying to each other, and should therefore be housed in separate rooms instead of wards. They are easily affected by disturbances, and any excitement, such as grief, anger, or worry, is usually followed by a fit of coughing and depression. Coughing is not only bad for the individual, but when patients are housed in wards it may disturb ten or fifteen others, and is also a strong suggestion which often causes an epidemic of coughing among them. The mistake and cruelty of placing in one room a number of persons suffering from a serious chronic disease is beginning to be appreciated; and there is no doubt that many patients who fail to make satisfactory progress against disease when housed in wards, rapidly improve when removed to the quiet and privacy of a separate room.... The psychological tendency of a private room is to make patients more contented, and also to increase their self-respect. Advanced case hospitals are built not only in order to care for the patient, but also to prevent the spread of pulmonary tuberculosis, which is due in a great measure to the cases of consumption which remain and die in their homes, infecting other members of their families. If all advanced cases could be cared for in hospitals, it is believed that the disease would more rapidly disappear. Public opinion at present will not allow the passage of laws compelling persons in the advanced stages of this disease to enter institutions for their segregation; therefore, hospitals should be made comfortable and home-like in order to attract the patients and hold them. This is one of a group of four buildings erected as a hospital for treating patients in all stages of pulmonary tuberculosis, and is one of two pavilions constructed from similar plans. It is two hundred and forty-eight feet long, built of wood, and rests on a concrete foundation and brick piers. For description it can be divided into a central block 36 feet wide by 65 feet deep; two wings 64 feet wide by 20 feet deep; and two extensions from the wings built in the form of right angles, each having about nine hundred square feet of floor area. The central block is two stories high with a cellar under it which contains three large locker rooms and a storage area for trunks. On the first floor is a sun parlor; a large room equipped with lavatories, baths, and toilets; a diet kitchen; a treatment room; and three small wards. The second story is 36 feet wide by 50 feet deep and is divided into nine bedrooms, a bath, and a linen closet. All the space in each wing is devoted to a large ward for advanced cases housing twenty patients. The extensions from the wings are open air pavilions and house twelve incipient cases. The building faces south with porches in front of the wards nine feet wide and in front of both arms of the pavilions five feet wide. The building has a capacity of seventy patients and cost $17,600. "State Sanatorium, Lakeville, Mass. ", postcard, c. 1910. This postcard view of one of the two ward buildings at Lakeville was produced shortly after the hospital's opening in 1910, and construction materials appear to be strewn about. Patients may be seen at on the "platform" or porch in front of the right-hand ward. Access to the porch was through full-height windows which reached to the floor permitting beds to be rolled outside. Lakeville State Sanatorium, Pavilion for Men, First Floor Plan, from Thomas Spees Carrington, Tuberculosis Hospital and Sanatorium Construction (New York: The National Association for the Study and Prevention of Tuberculosis, 3rd ed., 1914), p. 101. Thomas Spees Carrington, Tuberculosis Hospital and Sanatorium Constuction. New York: The National Association for the Study and Prevention of Tuberculosis, 3rd ed., 1914.